According to information accumulated by UNC intelligence, the enemy high command during the course of the New Year's offensive had decided to use the People's Air Force in support of future ground operations.1 In addition to more MIG-15s, the Chinese acquired enough Ilyushin (IL-10) ground-attack planes by March to equip at least two air regiments, and they held a special airground training conference in Mukden. The air commander, Liu Ya-lou, meanwhile had worked to develop Korean airfields on which to base supporting aircraft. He began this project at the turn of the year after his superiors forbade him to mount massed air attacks on UNC troops and installations from Manchurian fields for fear of concerted retaliation.2 To get the Korean air bases he needed, Liu had planned to establish air superiority over northwestern Korea and then to repair and improve air facilities in the protected region. Since the MIG-15s and IL-10s were short range aircraft, he also planned to restore forward airfields near the 38th parallel through which to stage them. Liu was handed control of the air between the Yalu and Ch'ongch'on rivers in January, when the Fifth Air Force demolished its forward fields at Kimpo and Suwon during the New Year's offensive and redeployed all jet fighters to Japan. Even by staging through other fields in southern Korea, the jets' range was too short to hold air superiority in the far northwest. Only in the first week of March was the Suwon field sufficiently repaired to allow jets to stage through it and reenter MIG Alley, and only at the end of the month could the Fifth Air Force compete with Liu's forces on near even terms. Enemy troops and civilian labor forces meanwhile began rehabilitating airfield runways and constructing revetments for aircraft. Under the MIG umbrella in the northwest they improved fields at Sinuiju, Uiju, and Sinanju. Outside the MIG cover they worked on a cluster of fields in and around Pyongyang, the fields at Wonsan and Yonp'o on the east coast, and four forward fields on the Hwanghae peninsula below P'yongyang. Far East Air Forces reconnaissance discovered Liu's work in February. Bomber Command prepared plans for attacks on the fields, but Brig. Gen. James E. Briggs (who had replaced General O'Donnell in January) believed the fields could not be destroyed once and for all because of the large repair crews available to the enemy high command. He elected to withhold B-29 strikes until the fields were about to become operational. He intended to bomb the fields out of action at that time and to keep them neutralized with attacks just heavy enough and frequent enough to offset repairs. 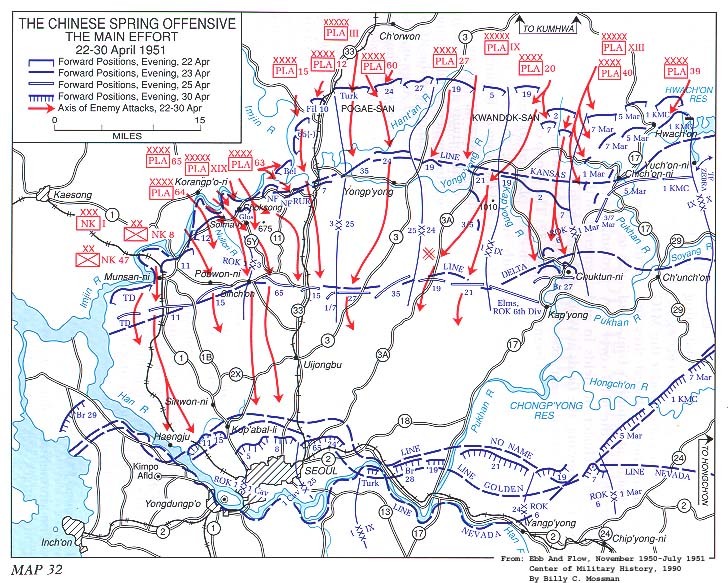 Aerial photographs showed the fields almost ready to receive aircraft near mid-April, and Briggs delivered repeated attacks between the 17th and 23d, concentrating on the forward fields and those in and around P'yongyang. The strikes stymied Liu's plans and preparations. At least there would be no air support during the spring offensive. Having lost radio and wire communications with his regimental commanders soon after the panic began, General Chang was hard pressed to regain control of his forces, even when they outdistanced the Chinese pursuit after midnight. Traveling rear areas throughout the night, Chang and his staff established a degree of order near dawn, collecting about twenty-five hundred members of his three regiments some ten miles south of the division's original front.14 To the same depth, the South Korean rout had peeled open the flanks of the 24th Division and 1st Marine Division to the west and east. Eager to close ranks as the IX Corps front quieted after daylight on the 23d, General Hoge ordered the ROK 6th Division to occupy positions on line Kansas, which was some three miles north of the area in which General Chang was reassembling his forces. The 1st Marine Division was to pull back against the Pukhan River to a line anchored near the Hwach'on Dam and curving southwest to a juncture with the South Koreans.17 Manning the long curve would compel General Smith to commit his entire division, and even then he would not be able to set up a solid front. And General Chang faced no small task in recovering troops who had scattered east and west into adjacent sectors, reorganizing his entire division, and then moving his nervous forces north toward the enemy. But the adjustments, if achieved, would retain control of the Hwach'on Dam, eliminate the marines' open left flank, and join the two IX Corps divisions with a minimum of movement. 1 In assessing their New Year's offensive, the Chinese reportedly attributed its failure largely to the absence or air support. With strong air support, a Chinese special aviation group concluded, "we could have driven the enemy into the sea." See Futrell, The United States Air Force in Korea, p. 265. 2 General Ridgway received authority for precisely such retaliation in late April. The Joint Chiefs of Staff told him: "he might now use United States forces within his command to conduct high altitude reconnaissance of enemy air bases in Manchuria and on the Shantung Peninsula, and further, that if United Nations forces in Korea were subjected to major enemy air attacks from outside Korea, he could at his discretion, and without the necessity of securing prior approval of the JCS, or higher authority, attack enemy air bases in the areas mentioned above." See MS, Ridgway, The Korean War, Issues and Policies, p. 163. 3 The information in this subsection is based on Futrell, The United States Air Force in Korea, pp. 265-78. 4 Griffith, The Chinese People's Liberation Array, p. 162; USAFFE Intel Dig, no. 96, 16-28 Feb 53; 1 Corps Rpt, The Communist First Phase Spring Offensive, April 1951, copy in CMH. 5 USAFFE Intel Dig, no. 1, 1-31 Dec 52. 6 USAFFE Intel Dig, no. 99, 16-31 Jan 53. 7 Hq, FEC, History of the North Korean Army, 31 Jul 52; USAFFE Intel Dig, no. 115, 1-15 Feb 53. 8 The North Korean 7th Division, which had been reduced to about regimental strength during recent operations, was transferred to the VII Corps in the Wonsan area. 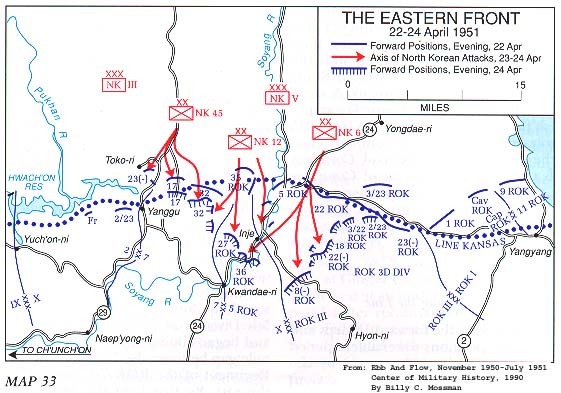 9 GHQ, FEC, Order of Battle Information, North Korean Army, 20 Aug 51 and 16 Sep 51; Hq, FEC, History of the North Korean Army, 31 Jul 52; Eighth Army PIR 284, 22 Apr 51. 10 Eighth Army AG File, 6 ROK Div, 1951, a special file of correspondence and reports on the operations of the ROK Division, 22-24 Apr 51; Interv, Appleman with Lt Col Thomas E. Bennett, KMAG Advisor to 7th Regt, ROK 6th Div, in CMH; Eighth Army POR, 22 Apr 51. 11 IX Corps Comd Rpt, Nar, Apr 51; Rad, IXACT-1288, CG IX Corps to CG IX Corps Arty, 14 Apr 51; Eighth Army AG File, 6 ROK Div, 1951; Gugeler, Combat Actions in Korea, p. 155. 12 IX Corps Comd Rpt, Nar, Apr 51; Eighth Army AG File, 6 ROK Div, 1951. 13 Wood, Strange Battleground, pp. 73-74; Eighth Army AG File 6 ROK Div, 1951; 1st Lt. Martin Blumenson, "Artillery in Perimeter Defense, April 1951," copy in CMH. 14 Eighth Army AG File, 6 ROK Div, 1951. 15 1st Marine Div Hist Diary, 22-23 Apr 51; Montross, Kuokka, and Hicks, The EastCentral Front, pp. 104-05. 16 1st Marine Div Hist Diary, 23 Apr 51; Montross, Kuokka, and Hicks, The East-Central Front, pp. 105-07. 17 Rad, IXACT-1330, CG IX Corps to CG 1st Marine Div et al., 23 Apr 51. 18 I Corps Rpt, The Communist First Phase Spring Offensive, Apr 51; 24th Div Comd Rpt, Nar, Apr 51. 20 Eighth Army Comd Rpt, Nar, Apr 51; Eighth Army G3 Jnl, 22 Apr 51; 25th Div Comd Rpt, Nar, Apr 51; 1 Corps Rpt, The Communist First Phase Spring Offensive, Apr 51. 21 25th Div Comd Rpt, Nar, Apr 51; 1 Corps Rpt, The Communist First Phase Spring Offensive, Apr 51. 22 3d Div Comd Rpt, Nar, Apr 51. 23 Ibid. ; I Corps Comd Rpt, Nar, Apr 51; Barclay, The First Commonwealth Division, p. 62; Crahay, Les Belges En Coree, pp. 60, 74, 80; Ltr, CG I Corps to CG Eighth Army, 15 May 51, sub: Report of Gloucestershire Battalion, 22-25 Apr 51, Incl 3 (reserves). 24 3d Div Comd Rpt, Nar, Apr 51; Ltr, CG I Corps to CG Eighth Army, 15 May 51, sub: Report of Gloucestershire Battalion, 22-25 Apr 51, Incl 3 (reserves). 25 3d Div Comd Rpt, Nar, Apr 51. 26 Eighth Army G3 Jnl, 22 Apr 51; Crahay, Les Belges En Coree, pp. 75-76; 3d Div POR 158, 22 Apr 51; 3d Div G3 Jnl, Entries 2 and 24, 23 Apr 51. 27 Crahay, Les Belges En Coree, p. 76; Barclay, The First Commonwealth Division, p. 62; 3d Div G3 Jnl, Entries 27, 38, 46, 52, and 65, 23 Apr 51; 3d Div POR 159, 23 Apr 51. 28 3d Div G3 Jnl, Entries 2, 24, 38, 39, 46, and 52, 23 Apr 51; 3d Div POR 159, 23 Apr 51; Barclay, The First Commonwealth Division, p. 62. 29 3d Div Comd Rpt, Nar, Apr 51; 3d Div G3 Jnl, Entries 62, 65, 75, 97, 105, and 114, 23 Apr 51; Ltr, CG I Corps to CG Eighth Army, 15 May 51, sub: Report of Gloucestershire Battalion, 22-25 Apr 51, Incl 3 (reserves) and Incl 16 (3d Div G3 Summary of 29th BIB Action, 2225 Apr 51); Crahay, Les Belges En Coree, pp. 76-79. 30 Ltr, CG I Corps to CG Eighth Army, 15 May 51, sub: Report of Gloucestershire Battalion, 22-25 Apr 51, Incl 3 (reserves); 3d Div Comd Rpt, Nar, Apr 51; 3d Div G3 Jnl, Entries 34 and 81, 23 Apr 51; 3d Div POR 159, 23 Apr 51. 31 3d Div Sit Ovlay, 22 Apr 51; E. J. Kahn, Jr., "A Reporter in KoreaNo One But the Glosters," New Yorker, 26 May 51; Farrar-Hockley, The Edge of the Sword, pp. 11-13, 16-18. Captain Farrar-Hockley was the adjutant of the Gloster battalion during the battle at the Imjin. 32 3d Div G3 Jnl, Entry 2, 23 Apr 51; Farrar-Hockley, The Edge of the Sword, pp. 18-22; Robert O. Hones, Now Thrive the Armourers (London: George G. Harrap & Co., Ltd., 1952), p. 150. 33 Farrar-Hockley, The Edge of the Sword, pp. 22-25; Hones, Now Thrive the Armourers, p. 150. 34 3d Div POR 159, 23 Apr 51; 3d Div G3 Jnl, Entry 52, 23 Apr 51; Farrar-Hockley, The Edge of the Sword, pp. 25-31, 36. 35 3d Div G3 Jnl, Entry 74, 23 Apr 51; 3d Div POR 159, 23 Apr 51; Farrar-Hockley, The Edge of the Sword, pp. 30-35. 36 Rad, GX-4-4635 KGOO, CG Eighth Army to CG I Corps et al., 23 Apr 51. 37 X Corps Comd Rpt, Nar, Apr 51; 7th Div Comd Rpt, Nar, Apr 51; Eighth Army G3 Jnl, Entry 1000, 23 Apr 51; Eighth Army POR, 23 Apr 51. 38 X Corps Comd Rpt, Nar, Apr 51; Eighth Army PIR 285, 23 Apr 51; Eighth Army G3 Entries 1405, 1500, 2130, 240905, and 240940, 23 Apr 51, and Briefing Notes for CG; Eighth Army POR, 23 Apr 51. 39 1st Marine Div Hist Diary, Apr 51; Montross, Kuokka, and Hicks, The East-CentralFront, pp. 110-13; After Action Intervs, Blumenson, "Artillery in Perimeter Defense"; 1st Marine Div POR no. 230, 23 Apr 51; Rad, IX ART-68, CG IX Corps to COs 987th FA Bn, 92d AFA Bn, and 11th Marine Regt, 23 Apr 51. 40 Rads, IX ACT-1338 and IX-ACT 1330, CG IX Corps to CG 27th BCB and CG 1st Marine Div, respectively, 23 Apr 51; After Action Intervs, 1st Lt. Martin Blumenson, "Tanks Above Kap'yong," Intervs with Maj Don W. Black, Asst S3, IX Corps Arty, and Ca apt Blaine Johnson, Asst S3, 213th FA Bn. 41 Ltr, Brig Gen George B. Peploe, IX Corps CofS, to CG Eighth Army, 5 May 51, sub: Report on Disintegration of the 6th ROK Division in Military Operations During the Period 22-24 April 1951, in Eighth Army AG File, 6 ROK Div (1 May), 1951. 42 Rad, IX ACT-1338, CG IX Corps to CG 27th BCB, 23 Apr 51. 43 Ibid. ; Rad, IX ACT-1340, CG IX Corps to CG 27th BCB, 23 Apr 51; After Action Intervs, Blumenson, "Tanks Above Kap'yong," Intervs with 1st Lt Kenneth W. Koch, CO, Co A, 72d Tank Bn, and Maj Wade H. Padgett, S3, 74th Engr Cmbt Bn; N. Bartlett, ed., With the Australians in Korea (Canberra: Australian War Memorial, 1954), pp. 91-92; Wood, Strange Battleground, pp. 74-75; Barclay, The First Commonwealth Division, p. 68. 44 Ltr, Peploe to CG Eighth Army, 5 May 51; sub: Report on Disintegration of the 6th ROK Division in Military Operations During the Period 22-24 April 1951, and Overlay, Disposition of 6th ROK Div, 231800 Apr 51, both in Eighth Army AG File, 6 ROK Div (1 May), 1951; After Action Intervs, Blumenson, "Tanks Above Kap'yong," Intervs with Black and Johnson; Barclay, The First Commonwealth Division, p. 67; Bartlett, With the Australians in Korea, p. 94. 45 Rad, IX ACT-1339, CG IX Corps to CG 1st Marine Div, 23 Apr 51; Montross, Kuokka, and Hicks, The East-Central Front, p. 117. 46 I Corps Rpt, The Communist First Phase Spring Offensive, Apr 51; 24th Div Comd Rpt, Nar, Apr 51. 47 3d Div 01 15-12, 23 Apr 51. 48 3d Div G3 Jnl, Entries 112 and 143, 23 Apr 51; 3d Div POR 159, 23 Apr 51; 3d Div Comd Rpt, Nar, Apr 51. 49 3d Div G3 Jnl, Entries 108, 110, 112, and 114, 23 Apr 51; 3d Div Comd Rpt, Nar, Apr 51. 50 3d Div G3 Jnl, Entry 61, 24 Apr 51; Ltr, CG I Corps to CG Eighth Army, 15 May 51, sub: Report of Gloucestershire Battalion, 22-25 Apr 51, Incl 3 (reserves) and Incl 16 (3d Div G3 Summary of 29th BIB Action, 22-25 Apr 51). See also article by two participants in the Hill 257 battle, Capt. William F. Long, Jr., and Capt. Walter M. Turner, "Challenge Accepted," in Combat Forces Journal, January 1952, pp. 12-16. 51 Crahay, Les Belges En Coree, pp. 79-81; Ltr, CG I Corps to CG Eighth Army, 15 May 51, sub: Report of Gloucestershire Battalion, 22-25 Apr 51, Incl 16 (3d Div G3 Summary of 29th BIB Action, 2225 Apr 51). 52 3d Div G3 Jnl, Entries 139, 141, 148, 157, 180, 182, and 189, 23 Apr 51; Ltr, CG I Corps to CG Eighth Army, 15 May 51, sub: Report of Gloucestershire Battalion, 22-25 Apr 51, Incl 3 (reserves) and Incl 16 (3d Div G3 Summary of 29th BIB Action, 22-25 Apr 51); 3d Div PORs 159 and 160, 23 and 24 Apr 51. 53 Farrar-Hockley The Edge of the Sword, pp. 30, 36. 54 Eighth Army G3 Jnl, 23 Apr 51; Eighth Army PIR 285, 23 Apr 51; Eighth Army Comd Rpt, Nar, Apr 51; I Corps Comd Rpt, Nar, Apr 51; I Corps Rpt, The Communist First Phase Spring Offensive, Apr 51. 55 Farrar-Hockley, The Edge of the Sword, p. 34; Hones, Now Thrive the Armourers, pp. 152, 155; Ltr, CG I Corps to CG Eighth Army, 15 May 51, sub: Report of Gloucestershire Battalion, 22-25 Apr 51, Incl 14 (Summary of Enemy Operations); Kahn, "A Reporter in Korea- No One But the Glosters." 56 Interv, Appleman with Van Fleet, 15 Sep 51, copy in CMH.